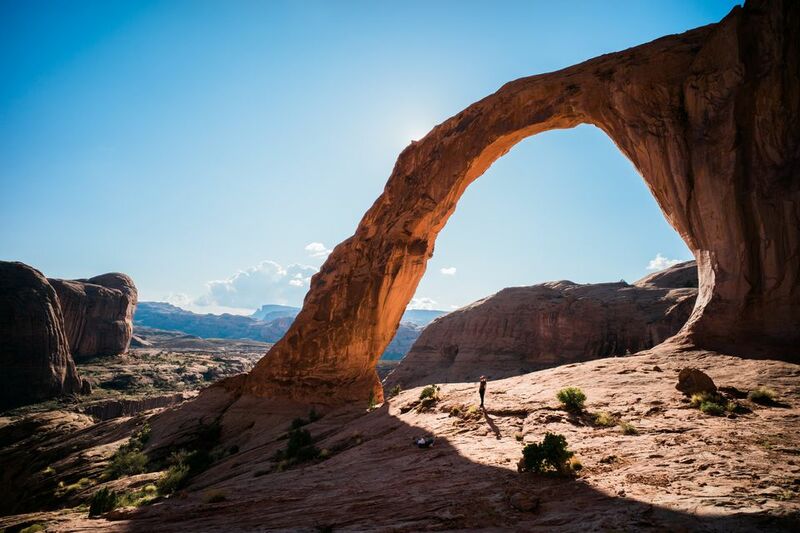 Utah is filled to the brim with spectacular views, established National Parks, and a flurry of outdoor activities, making it a great state for RVers seeking untouched areas of the United States. There’s a bit of everything for every traveler when visiting this western state. Check out these top five favorite RV parks and campgrounds so you can get the most out of the Beehive State. Pony Express RV Resort takes care of all your creature comforts in the unique layout of northern Utah. You won’t be asking for much as Pony Express has plenty of features. Your site comes with full utility hookups, cable TV, and internet access, including a personal picnic table. You have all the amenities to get clean such as bathrooms, showers, and laundry facilities. Other basic features include a rec hall, a lending library and DVD rental, convenience store, propane fill up, and a courtesy patrol around the park to take care of any issues. Northern Utah may not be as saturated with sprawling parks like southern Utah but there is still plenty to do. You have all the hiking, biking, and great views of the Great Salt Lake, home to some of the best sunsets in the country. If the water is at the right spot, head to the northwest corner of the lake to see the Spiral Jetty. You are also a few minutes outside of Salt Lake City, home to some great museums, dining, and other attractions. Panguitch may not be as highly rated as Moab but it is still a prime destination for high desert adventure. Stay at the Panguitch KOA to get right up on the action with all your favorite amenities and features. You can get a pull-through site, complete with full utility hookups and a digital antenna to catch local stations. Showers and bathrooms are kept neat and tidy and this KOA rounds out its facilities with a pool, playground, group pavilions, and propane refill. This KOA has a great centralized location to enjoy all the fun in Panguitch and surrounding southern Utah. You are surrounded by Bryce Canyon National Park, Cedar Breaks National Monument, Red Canyon State Park, and you’re not too far away from Zion National Park. If you’re looking for some unique angling, Panguitch Lake is only 17 miles up the road. Try to make it to this park in late June to catch the unique hot air balloon rallies. People think of high desert landscapes when thinking of Utah but certain parts of Utah are excellent for winter activities. A Mountain Valley valet will guide you to one of 95 RV sites outfitted with 30/50/100 amp hookups, along with water, sewer, free cable TV, and the internet. Personal space seekers rejoice, the bathrooms and showers at Mountain Valley RV Resort are private. You have a fitness center, RV supply shop, camp store, full kitchen in a common area, and plenty of onsite recreational activities like horseshoes and volleyball. Heber City is in the Heber Valley Rocky Mountains and is full of blue ribbon angling hotspots like the Provo River. If you’re bringing your ATV, you’ll get plenty of use out of it on the local trails. Take a scenic ride on a Heber Valley Railroad Excursion or drift over the landscape in a hot air balloon. Mountain Valley is also over a half hour from all the thrills and slopes of Park City, Utah, which house some of the best snowboarding courses in the country. Moab is rated as one of the top tourist destinations for those who love the outdoors and Spanish Trail RV Park can be the base for your Moab adventures. After a long day in Moab, you want to return to your creature comforts and ​Spanish Trail RV Park has them. They have large pull-through sites outfitted with full utility hookups along with free cable TV and Wi-Fi, all underneath shade to protect you from the harsh Moab sun. The bathrooms and shower facilities received a 10/10 from the Good Sam RV Club, so you know they’re spick-and-span. Other facilities include a dog park, laundromat, group pavilions, convenience store, and large lush grass areas where you and the kids can play around. You have two popular National Parks: Arches National Park and Canyonland National Parks, including the popular Dead Horse State Park. You can spend days hiking and biking the trails around these parks or going all out on a backpacking adventure. You also have whitewater rafting on the Colorado River or catching incredible views of the La Sal Mountains. If you’re looking for a little less adventure, you can take a scenic drive around the parks or try a few rounds at Moab Gold Resort. Zion River Resort RV Park and Campground drops you right into the middle of the gorgeous Zion area with all the amenities and features you could ask for. Each site comes with full utility hookups, a tree for shade, fire ring, picnic table, cable TV and internet access, and that’s at your individual site. Restrooms and showers are private with individual rooms with toilet, sink, and shower. Other facilities and amenities at Zion River include a social hall for groups, 24-hour laundromat, propane refill, a takeout grill, camper kitchen, camp store/gift shop, and a dog park. As for things to do, the Zion area has them. The prime jewel of the area is Zion National Park and Zion Canyon. Catch some spectacular views, a sky loaded with stars, and plenty of wildlife in Zion. This is a National Park that should be on everyone’s bucket list. Other areas of interest include Pipe Springs National Monument, Snow Canyon State Park, and the Brigham Young Home. Utah, like other locations in the western United States, offers something for everyone. Whether you’re traveling through the state or want to visit some of its picturesque destinations, you’ll find the above five RV parks and campgrounds some of the best in the nation.